Braving the bustle of Black Friday is the penitence paid for overeating on Thanksgiving. Where my heart and bloated bod would prefer curling on the couch with coffee and the rhythm of the pounding ocean waves, husbandly duty sent me to a string of shops and boutiques. I found her on the second floor of The Fisherman’s Daughter boutique. She was waiting at the topping of the stairs. The Driftwood Angel. No piece is perfect. Each piece has been tumbled and tossed, splashed and shattered. Each has been broken. And each is crucial. The craftsman takes the pieces, shapes them into an angel, wings and trumpet included. The broken and faded, chipped away and tossed away brought together to express the divine. Indeed, the body does not consist of one member but of many. If the foot would say, ‘Because I am not a hand, I do not belong to the body,’ that would not make it any less a part of the body. And if the ear would say, ‘Because I am not an eye, I do not belong to the body,’ that would not make it any less a part of the body. If the whole body were an eye, where would the hearing be? If the whole body were hearing, where would the sense of smell be? But as it is, God arranged the members in the body, each one of them, as he chose. If all were a single member, where would the body be? As it is, there are many members, yet one body. The eye cannot say to the hand, ‘I have no need of you,’ nor again the head to the feet, ‘I have no need of you.’ On the contrary, the members of the body that seem to be weaker are indispensable, and those members of the body that we think less honorable we clothe with greater honor, and our less respectable members are treated with greater respect; whereas our more respectable members do not need this. But God has so arranged the body, giving the greater honor to the inferior member, that there may be no dissension within the body, but the members may have the same care for one another. 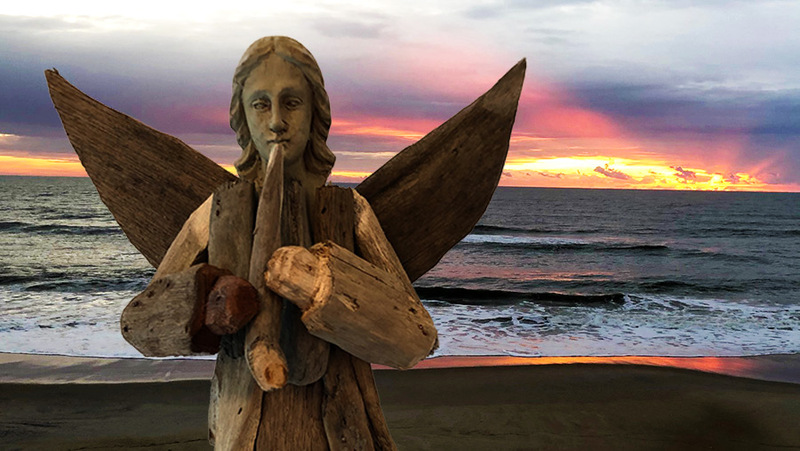 The Driftwood Angel isn’t so much a holiday decoration as it is a Christmas declaration. She sounds across the seven seas and all the lands in between that a child has been born. A King calling not the haughty but the humble. A shepherd who will gather to Himself a flock and will chase down all who drift. A Carpenter, a Craftsman who can create a universe with a word, but desired to create a Body out of the broken and rotted and scattered. I know what it’s like to drift, be tumbled by the waves, dumped on a strange shore, feel like nothing next to the pearls and pretty shells. But I have been reclaimed, made a crucial piece in projecting the divine. As we turn to the Christmas season know that you, too, are crucial and the Craftsman is waiting to reclaim you. For those already attached, can you too scour the beaches for pieces to add? The Driftwood Angel is not yet complete. Very creative analogy… really enjoyed it. Thanks, Al!